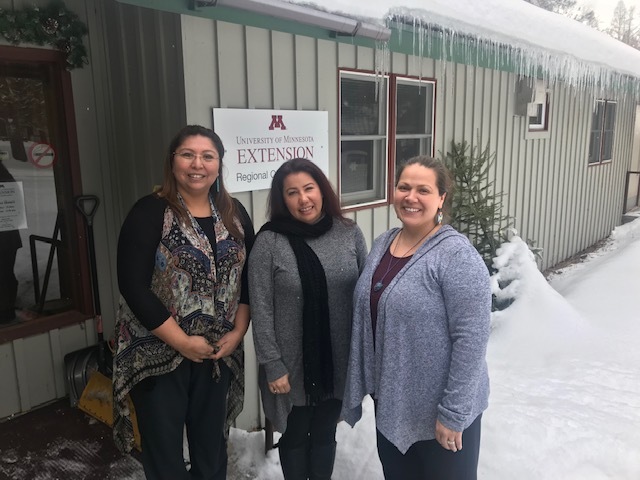 Extension Center for Family Development recently received two grants to work cooperatively with local partners on the front line of the opioid crisis in rural Minnesota. They are Rural Health and Safety (RHSE) and USDA and Substance Abuse and Mental Health Services Administration (SAMHSA) as part of a partnership with the Center for Community Vitality and University of Minnesota College of Pharmacy – Duluth. This is a new project that brings together a team that includes Extension staff, public health agencies, community members, and healthcare professionals who are guided by the 7 Generation Plan, elders and the wisdom of the tribal community. This work is intended to facilitate engagement with rural Minnesota counties and tribal communities that suffer a disproportionate burden from the opioid crisis. The focus of the project is to develop and highlight community-based solutions to the opioid crisis and community capacity building with partners most impacted by the opioid crisis in rural Minnesota. This project aims to promote community protective factors and reduce the impact of risk factors to prevent opioid use and support sustained recovery. Local community leadership groups to increase capacity of recovery organizations. A framework for assessing community recovery capital. A toolkit for creating recovery capital in rural communities. Technical assistance and training for healthcare service providers, community and recovery organizations, individuals in recovery and the community members. Online learning community for a variety of audiences — healthcare service providers and practitioners, community and recovery organizations, employers/employees, individuals in recovery and the community members that includes educational resources, trainings, online courses, public awareness tools, videos, and more. A team to work specifically with American Indian families and communities. Held eight monthly meetings between each of the grants. Developed a website and informational flyer. To learn the specifics of each of the grants and members of each of the teams, please visit our website opioid.umn.edu. Hired three new opioid prevention team members that will focus on the health and well-being of American Indian families and communities to help find useful solutions and educational approaches to help end opioid addiction. The positions are supported by the SAMHSA Grant. Briana Michels joins the team as a community educator and be based in the Pine County Extension Office. Susan Beaulieu, a community educator, is based in the Extension Regional Office in Brainerd. Tawny Smith-Savage, community coordinator, is based in the Extension Regional Office at the Cloquet Forestry Center. This team, under the supervision of Jennifer Garbow, will help reduce opioid use and stigma by building and nurturing relationships and partnerships through community outreach, working with community members to identify effective strategies and educational tools and providing education and training to the community. Further, they will provide coordination of community coalitions and educational activities along with building and nurturing relationships and partnerships within the community. Hired a Graduate Student in the Applied Research and Evaluation unit, Cole Hanson, to help support RHSE Grant. See his bio here! Hired an AmeriCorps VISTA (Volunteers in Service to America), Amanda Hawthorne to support the focus groups and key informant interview for the RHSE Grant. Met with seven different county boards, coalitions and recovery organizations. Conducted 25 focus groups or key informant interviews. Interviewing candidates for the academic technologist position for the SAMHSA grant this week. Posted a position for an overall project coordinator for the SAMHSA grant and hope to have someone on board soon! Featured in three county newspapers with another going to press this week. What are our next steps? To find out, please join us for our webinar “Community Based Solutions to the Opioid Crisis In Rural Minnesota" on February 15th from 10:00 to 11:00 a.m. If you have not yet received a calendar invite, please email me and we will get you on the list!